The Salvation Army had camps in Upland Boro for a number of years. The above picture is from the 1930's. Note: The Salvation Army began in London in 1865 and started in America in 1899. 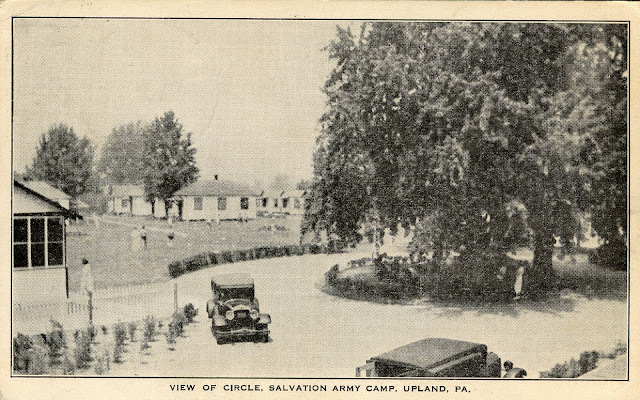 Today we do not think of the Salvation Army as a "army" but it was different a 100 years ago. This article is from June of 1918 to help with WW1. Tinkle of bells in the wood rim the rate of consecrated knuckles on the tambourine, the blue-hooded face arched by the blood-red ribbon of “Salvation,” the appealing blue eyes of the modest young “Army Maiden” stopping before you while you fumble for a quarter, a half, or maybe a penny and your thoughts, perhaps also your heart, go with them as they march away from their corner meeting down the street, falling into faint, sweet echoes like the sound of good deeds in this war-racked world. But it wasn’t the tambourine yesterday. Marching a dozen abreast into the wide gate of the Edward Crozer estate at Upland, yesterday morning, a well-drilled body of Salvation soldiers, with banners not “golden, glorious, olden” but of blood and fire and blue wound up the long avenue, led by the salvation army Staff Band of twenty-five pieces, and playing – oh, what? Not the ordinary blatant march tune, but a stirring processional of “blood and fire?” Military? Yes. But a function of the Army is always different from anything else; and it doesn’t cut any ice whether you are destined to wield pitchforks or harps, you will take off your hat to those militant, independent workers of the world on the spiritual plane. 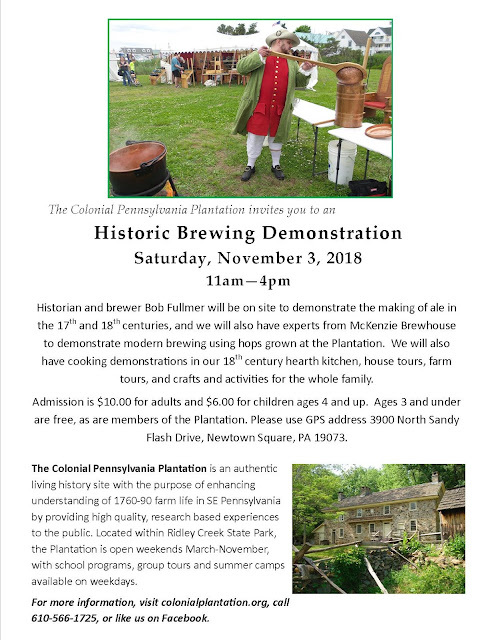 MANY CITIES REPRESENTED – There were delegations from Philadelphia, Camden, Wilmington, Norristown, Pottstown, Chester and many other places of barracks. Prominent in the line were the cadets from the Salvation Army Training School, Philadelphia. Col. Charles Miles, principal of the school, Philadelphia; Adjutant William Black, Pottstown; Ensign Marion Tweedie, Norristown; Capt. Harriet Patch, Chester; Adjutant Smith, Philadelphia; Brigadier Annie Cowden, of the Hone for Women and Children, Philadelphia; Mrs. Major Crawford, Philadelphia; Adjutant Florence White, of the Day Nursery, Philadelphia, and a long line of the ancient worthies of Salvation, grown gray but not weary in the battle that never ends. When the summit of the park was attained, these marchers took their places in the great campus between the buildings and before the speakers’ stand, surrounded by flaunting foliage of old trees; flowed in between and around then, packing every available spot of the greensward until the speakers themselves ascended the platform amidst the shouts and fanfare of banners, ribbons and of everything that could be waved, while a mighty shout of acclaim arose. Then there were the massed yells of the Training School class, drowned by the band’s music. GREETED WITH APPLAUSE – As Mayor McDowell, Col. Charles Miles and Major Crawford ascended the stand the great cheer was renewed. It was a welcome, hearty and sincere. When the speakers for the day were seated and an expectant quiet had settled, Major Storey of Philadelphia, made an invocation, and Brigadier Cowden of the Philadelphia Rescue Mission and Children’s Work, read the Scripture. With its yellow, red and blue? Waves aw message grand and true. Lift up the army banner, Blood and Fire! Blood and Fire! Lift it higher! For it tells of full salvation. For the sins of every tribe and nation. When the blood flowed from His side. And to help us save the lost. What though all the hosts of Hell engagers? Christ is Captain of our band! Then followed other songs: “He is my all in all,” and “America,” which you ought to hear the Salvation Army sing with its band, and you will take off your hats to it for two reasons. Major Crawford introduced Mayor McDowell with a few good words, and then the tumultuous welcome was repeated in the Mayor’s honor. CITIES ARMY WORK – He was proud of the Salvation Army work of the twenty or thirty years of Sunday Salvation work. He gave several narratives of consecrated soldiers; of one seven times wounded, and when he went, said to his superior officer, “The gun is in good condition, sir,” and died. “That is heroism.” They will die for the flag. “You can’t find a slacker in the Salvation Army under that flag,” he said, pointing to “Old Glory.” “May our boys soon march home in victory! The Kaiser is not God. God Himself is God,” he said, and then paid glowing tribute to the boys and the saving of them giving earnest congratulations to the donors of this ground. “I pray God may keep us until we come into our own. Faithful here for youth and manhood, the Salvation Army is a wonderful organization. After thirty-seven years I am prouder of it than ever.” He alluded to the Salvation Army banner as the “Rising Sun Flag,” and America’s as a rising sun flag. “Germany won’t wipe out those flags; the two will win together.” His fine tribute to Commander Booth brought fervent cheers. “When Miss Booth stands on her feet, she is the greatest orator in America,” he said. Colonel Miles concluded with an appropriate dedicatory prayer to the Heavenly Father, placing in His hands these buildings in His name for children, and a new lease of life for all and referred to the gift as of spiritual significance for young lives, remade here in these beautiful buildings and grounds and in the name of ‘our mothers’ God and our fathers’ Christ.